This collection combines three of our most popular products on one USB flash drive. 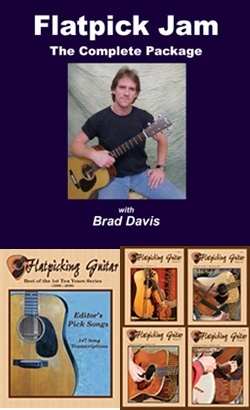 In this package you will receive the Flatpick Jam: Complete Package by Brad Davis ($34.95 value). This package includes play-along mp3 files for 48 of the most popular flatpicking tunes. For each tune you receive slow, medium, and fast backing tracks and multiple transcribed versions of each tune in both standard notation and guitar tablature (see below for more information). You will also receive the PDF and audio files from our Editor's Pick Song collection ($30.00 value). This collection includes transcriptions of 147 flatpicking tunes and songs presented in both standard music notation and guitar tablature (see below for more information). Lastly, you will receive the PDF and mp3 files from our Fiddle Tune Back Issue Package (a $20 value). The package includes our two special Fiddle Tunes Issues, plus our Waltz Issue and our Old-Time tune issue. Each issue includes two arrangements of 20 different tunes. (see below for more information). This total package provides you with over 275 flatpicking tune arrangements! On this DVD-Rom disc you will find all of the Flatpick Jam (play-along) tracks for the 49 tunes that appear on all of the Volumes of Brad Davis' Flatpick Jam series. Additionally, in the "Flatpick Jam Tabs" folder on this disc, you will find a folder for each tune that includes transcriptions provided by Brad (the numbered transcriptions), plus any arrangement of that particular tune that has appeared in Flatpicking Guitar Magazine during our first 10 years of publication. This means that you will get anywhere from 4 to 10 different variations of every tune tabbed out. Additionally, the audio tracks that are companions to those FGM arrangements are also included. This is the ultimate Flatpick Jam package and a must have resource for anyone who wants to build their flatpicking repertoire, learn variations, and study different arrangements of all of the standard jam session tunes. And you are able to practice all of your arrangements at four different tempos by jamming along with Brad Davis! With Brad Davis' Flatpick Jam Series, you are never without a jamming partner. This DVD-Rom contains 49 flatpick jam favorites (in mp3 format). Brad plays each tune at four different tempos (slow, slow/medium, medium/fast, and fast) so that you can work on your tone, timing, note clarity, and fluidity at the slower tempos and then work to develop your speed at the higher tempos. At each tempo Brad takes a solo and then plays rhythm so you can take your solo. At the three higher tempos Brad swaps solos and rhythm with you twice. This gives you the opportunity to practice your solo and rhythm seven times on every tune. On each tune Brad plays a variety of rhythmic and lead styles. A bass line and mandolin chop accompany every song at every tempo. This collection contains PDF versions of 147 song transcriptions that were chosen by Flatpicking Guitar Magazine's Editor from the issues of Flatpicking Guitar that were published from November/December 1996 (Volume 1, Number1) through September/October 2006 (Volume 10, Number 6). All audio tracks are presented in mp3 format. Note: Due to the fact that Flatpicking Guitar Magazine did not produce audio CDs for the first 17 issue of the magazine, not all of the audio tracks are available. However, of the 147 transcriptions that are in the "Editor's Picks" PDF book, audio tracks for 126 of those transcriptions are available on this disc in mp3 format. To view the song list, click here. This Special Back Issue Package includes 4 of our special Fiddle Tune style issues. This includes our two Fiddle Tune Issues plus our Waltz Issue and our Old-Time Music Issue. Each of these issues are packed with two arrangements each of 20 different tunes. This complete package gives you two arrangements 80 great tunes!